Question: How do we force a round bubble into a square? 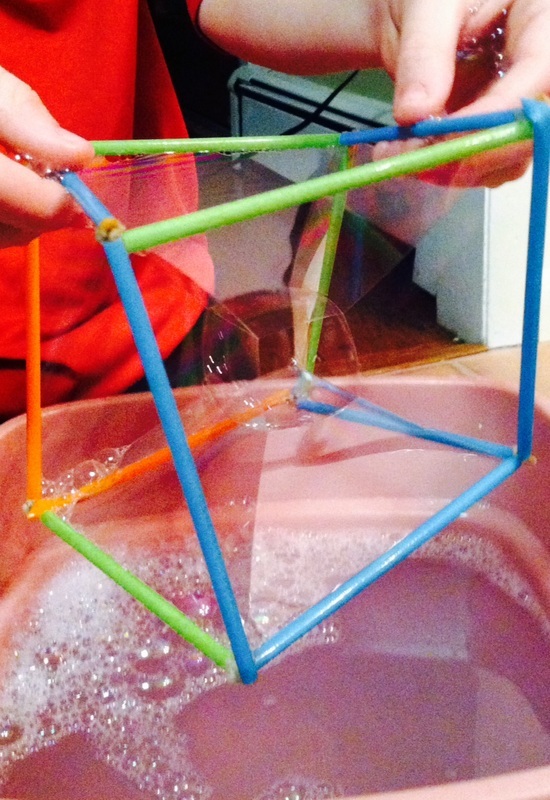 Hypothesis: If we make a cube bubble structure then we can create a square bubble. 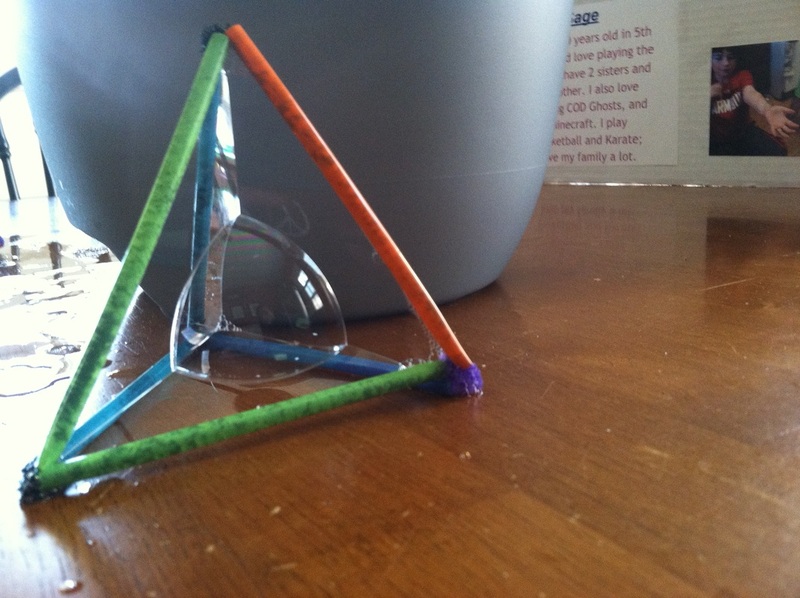 Triangle bubbles are possible when you make a triangle structure. - Do not put bubble solution in your eyes. - Do not drink bubble solution. Let mixture sit for 24 hours - also clear the foam off the top. Dip bubble cube in bubble solution. Then, take out the bubble cube and make sure all the sides have bubble solution on them except the top. Lightly wiggle the cube so it looks kind of like a sand timer. Create a separate bubble using a pipette. Trays - under the buckets of bubble solution. The square bubble as formed by the cube structure made of straws. Bubbles form because of the surface tension of water. Surface tension is when the surface of a liquid, where the liquid is in contact with gas, acts like a thin elastic sheet. Normal bubbles, (round bubbles) enclose the maximum volume of air with the minimum amount of bubble solution. Using a square bubble device will help to create a much smaller minimum surface which makes it possible to make a cube shaped bubble! Cohesion and adhesion take a big part to making a square bubble. Cohesion is the forming of a water droplet (when H2O particles stick to each other). Adhesion is when water sticks to other substances such as: the glycerin and soap in the bubble solution. Adhesion is also when the solution sticks to the frame of the bubble device. It was difficult to get the bubble solution to be the right consistency. We determined that we needed to add more dish soap and glycerin to make the solution work more consistently. We learned that it is best when the solution sits for 24 hours so that all of the ingredients can become more stable and stronger (adhesion). After 2 days the bubble solution was not usable - it did not form bubbles anymore. 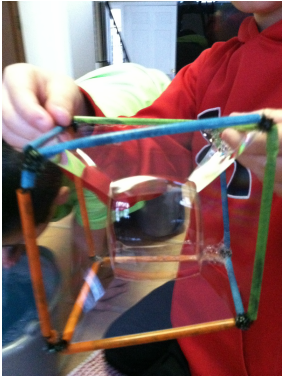 It was also difficult for the cube structures to stay in 1 piece when we were trying to make the bubble. We tried to use clay to stabilize the corners of the cube structure but then the clay contaminated the bubble solution - so that was no longer an option. Eventually we figured out a better way to keep the structure from coming apart. Sometimes the square bubble formed on its own when we took it out of the solution (without having to drop in an additional bubble in the center using a pipette). You can also make a pyramid structure by making a triangular shaped structure - which leads us to believe that we can probably make bubble that are others shapes also - like a rectangle.